Sunday brunch for the whole family was at First Food & Bar at the Palazzo where we booked a large table for 11:00 a.m. when they open. 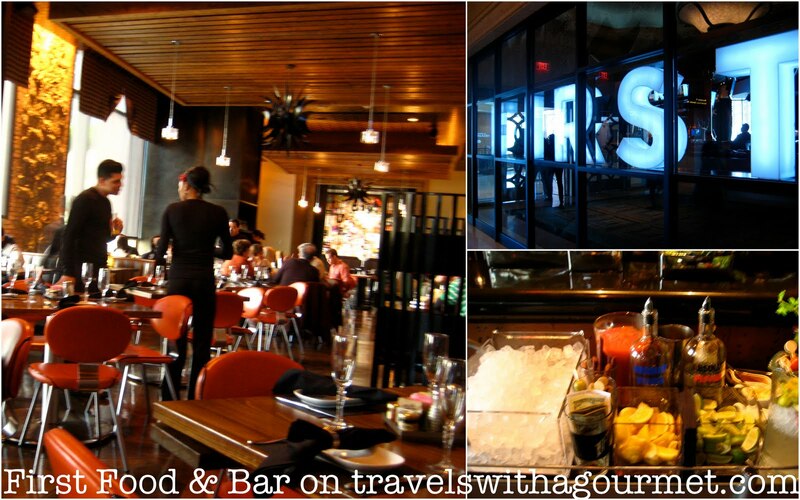 First is a casual bar/restaurant serving American cuisine in a sports bar atmosphere. The chairs are retro diner-style red leather and the menu items are American classics. Opened less than a year ago, First serves breakfast, lunch, dinner plus a late-night menu daily. They also serve brunch all-day on Sundays. The brunch menu is a slightly shorter version of the lunch menu with a few breakfast items added in. Their box brunch set menu is $14.90 (for another $7, you get unlimited champagne). It gets a bit confusing as the menu is split into different sections called “boxes” (e.g. classic box, omelets box, salad box, “sam”wich box, pizza box, brunch burger box) from which you have to pick one item. There is also the “5 buck add-on box” where for $5. 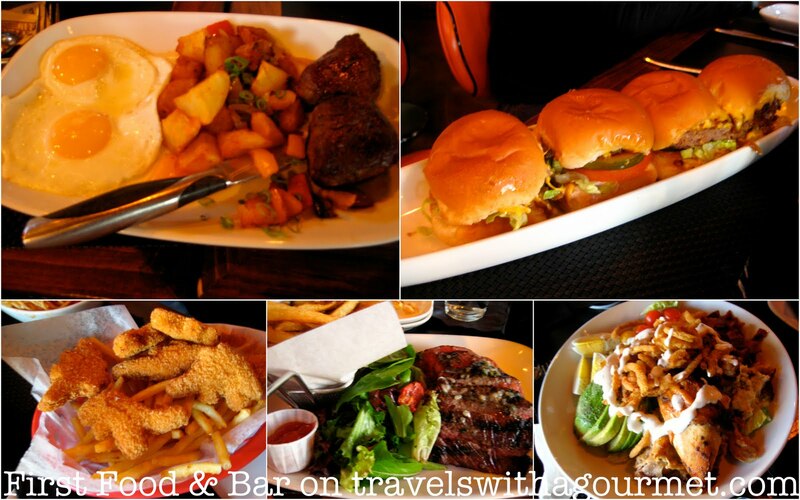 more, you can choose from steak and eggs, steak frites, chicken and fries, salmon and fries or a fried pork chop. There are also several side dishes for another $6 – first home fries, herb-Parmesan shoestrings, ore-ida tater tots, truffle mac & cheese, biscuits & gravy etc. Are you confused yet because I was after adding all the add-ons and extras and figuring out the “box” menu. After we placed our orders, the drinks cart rolled over for C’s bloody mary order followed by the complimentary mini-sugared donuts they serve in tiny fryer baskets lined with wax paper – really cute. I ordered the steak frites which was fine and came with salad and some Bearnaise sauce. Other orders were the steak and eggs which, strangely enough, was two filet mignon steaks (for breakfast?) with two eggs and home fries and a salad of BBQ spiced half chicken whole Cobb (a.k.a. half a roast chicken over a whole portion of Cobb salad – lettuce, avocados, egg and buttermilk dressing). From the classics box – the brisket hash which is corned beef brisket topped with fried eggs and served with fresh fruit. there were also mini burgers (four mini burgers with special sauce. lettuce, cheese, pickles, onions and tomatoes on buns – doesn’t that sound like a mini big mac?) and a turkey club sandwich. The kids have a special set menu for $11-ish which comes with a main course (spaghetti with meatballs, dinosaur nuggets and fries, mac and cheese), dessert (donut sundae, ice cream or ice cream sandwich) and a drink. First is a convenient place to go with the kids on a lazy Sunday afternoon – the food is fine and the music is loud and the kids can play in the photo booth ($1 for 4 photos) while mom and dad enjoy their brunch.